Stunning 1960's vintage COURREGES mod coat. White double faced wool. The welted seaming is what defines the marvelous coat. Rounded collar and lapel. Welt princess seaming front. Four button front close with original metallic gold buttons and bound button holes. Long sleeves with welt seams and rounded corners at cuff buttons. Rounded hip pockets with corded seaming and rounded flaps. Attached 1/4 belt back. Full taffeta lining. Outstanding example of classic Courreges design in winter white! Shoulder, measured from seam to seam across back yoke - 12 1/2"
Sleeve, measured from seam to hem edge - 22"
Back length, measured from collar fold to hem edge - 35"
EXCELLENT condition. Upon close inspection shows a few minor soil marks. Bottom button worn at edge. Issues are insignificant. 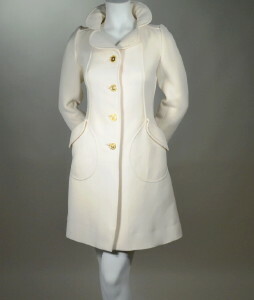 Coat is in marvelous condition and a fine Courreges piece!